A chiral derivative of 1,2-benzenedisulfonimide, namely (-)-4,5-dimethyl-3,6-bis(o-tolyl)-1,2-benzenedisulfonimide is herein proven to be an efficient chiral catalyst in a one pot three-component Biginelli reaction. A chiral derivative of 1,2-benzenedisulfonimide, namely (−)-4,5-dimethyl-3,6-bis(o-tolyl)-1,2-benzenedisulfonimide is herein proven to be an efficient chiral catalyst in a one pot three-component Biginelli reaction. In fact the yields of the target dihydropyrimidines were very high (25 examples; average 91%) and enantiomeric excesses were always excellent (14 examples; average 97%). Ultimately, we herein propose a procedure that displays a number of benefits and advantages including the total absence of solvents, mild reaction conditions, relatively short reaction times and stoichiometric reagent ratios. 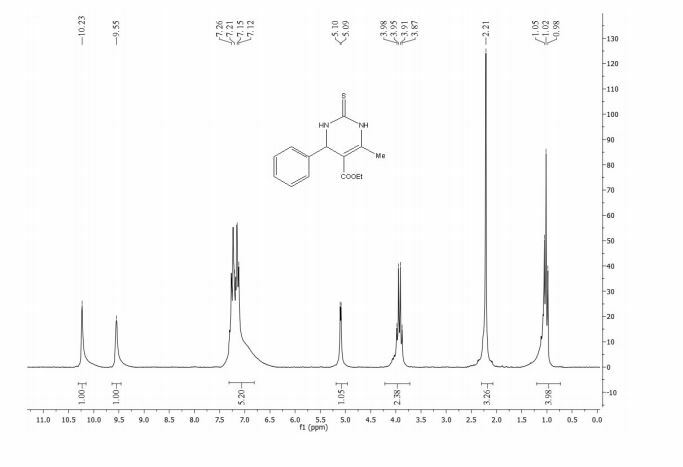 Target dihydropyrimidines are obtained in adequate purity, making further chromatographic purification unnecessary. Moreover, the chiral catalyst was easily recovered from the reaction mixture and reused, without the loss of catalytic activity. (R)-(-)-Ethyl 6-methyl-4-phenyl-2-thioxo-3,4-dihydropyrimidine-5-carboxylate (5a): pale grey solid (135 mg, 98% yield); mp 201–202 °C ( from EtOH; lit17 200–202 °C). 96.4% Ee (GC connected to a J&W Scientific Cyclosil-B column; stationary phase: 30% heptakis (2,3-di-Omethyl-6-O-t-butyldimethylsilyl)-β-cyclodextrin in DB-1701), tR= 12.11 min (major), tR= 12.54 min (minor); [a]D -65.4 (c 0.1 in MeOH). 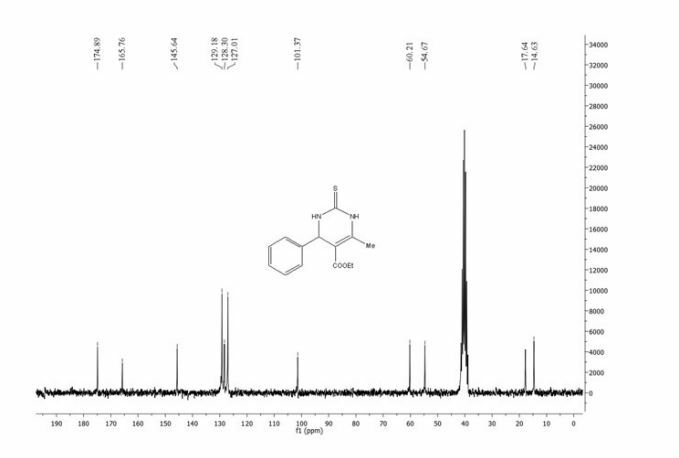 13C NMR (50 MHz, DMSO-d6): δ = 174.9, 165.8, 145.7, 129.3, 128.3, 127.0, 101.3, 60.2, 54.7, 17.8, 14.7. MS (m/z, EI): 276 [M+ ] (45), 247 (40), 199 (100). IR (neat) ν (cm−1): 3311 (NH), 3112 (NH), 1665 (CO), 1195 (CS).